Contrary to most media reports, there’s more going on in the realm of automotive technology than driverless cars. Yes, autonomous vehicles are being tested from Silicon valley to Pittsburgh, but it will likely be a decade or more before armies of legislators untangle the legal issues such vehicles raise. In the meantime, you can drive a car off the lot today — or soon, anyway — packed with features that sound like they were cooked up by a nerdy screenwriter: cars that can see around corners, smart windshields that highlight a stray pedestrian, and cars that know how you’re feeling. Here’s the stuff you should be excited about now. Until performance cars can actually intuit what we’re thinking, HAL-style, here’s the next coolest advance: controlling your car by barely twitching a pupil. Porsche’s all-electric Mission E Concept, reported to be destined for production by 2020, boasts stunning specs (zero to 60 mph in less than 3.5 seconds). But the smartest feature is inside the cockpit, where infrared cameras read subtle eye movements to control in-dash systems. By glancing at the music or navigation menus, you initiate which system is controlled by a button on the steering wheel. The car even uses pupil tracking to rearrange the instrument display to best suit your sight line. The same cameras can also read faces to deduce mood, and a corresponding emoticon is posted on the dash. That may sound ridiculous, but it’s a precursor to lifesaving applications, including monitoring a driver’s drowsiness and stress levels. Carmakers are already leveraging GPS data to fine-tune your car’s mechanical systems on the fly. The GPS-connected transmission in BMW’s 7-Series knows when you’re about to enter a stretch of twisty, ascending road, and the car downshifts in advance so you don’t need to hunt for more power. Similarly, Tesla uses GPS data to raise and lower its P90 sedan’s and Model X SUV’s suspension automatically — in advance of a steep curb in front of your driveway or on a pothole-strewn road — in order to give the vehicle full clearance to avoid scraping the underbody. “This is bigger than seat belts,” says John Capp, a director of Global Safety Strategy for GM. He’s referring to GM’s V2V (vehicle-to-vehicle communication), a safety application that alerts drivers to dangerous conditions they can’t see — say, a car around a corner about to blow through a stoplight, or a fog-induced slowdown. The 2017 Cadillac CTS Sedan, debuting later this year, will be the first to have the tech. Here’s the idea: A small radio transmitter broadcasts a suite of data including your vehicle’s speed, direction of travel, and braking information, which is in turn received by any vehicle with the same technology up to a half-mile away. If danger is lurking, your car will alert you and brake if necessary. 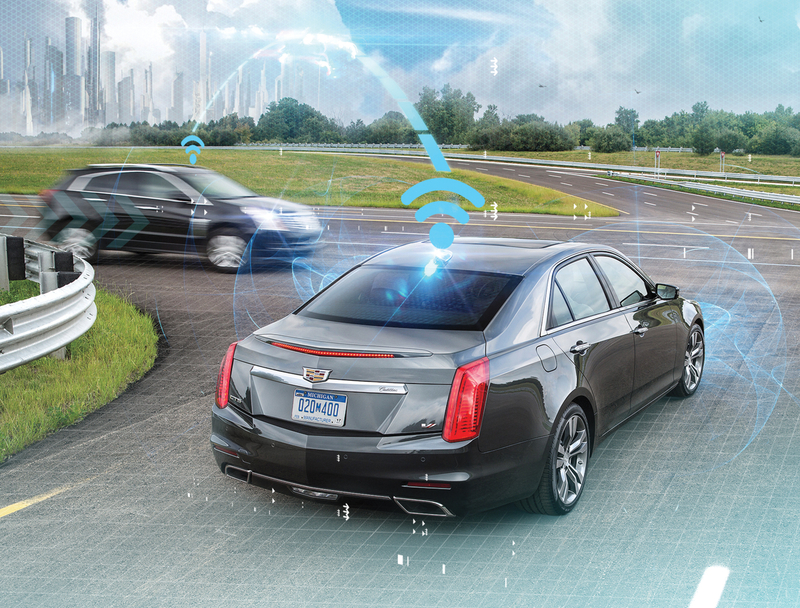 Early adopters of V2V, such as buyers of the new Caddy, will gain little benefit from it at first, since it can only obtain information from other cars with the same device. But Cadillac may be getting a jump on the competition — experts agree that V2V may be required in all cars for sale in the U.S. within five years. What if you could see the road ahead at night lit up like an airport runway, even with your headlights off? It’s already happening in the Dutch city of Oss, where three lines of photoluminescent paint highlight each lane of the N329 highway without using any electricity. The project is a pairing between Dutch engineering company Hejimans and designer Daan Roosegaarde, and it represents a step toward energy-efficient highway lighting. With widespread use of the special paint, the need for streetlights could one day be eliminated altogether. Here’s one way to prevent accidents that occur when snow starts to fall: streets that melt ice. Scientists in Turkey have come up with a material that continuously releases salt as cars drive over it, as well as prevent black ice from developing when temperatures drop quickly. Additional salting would still be required, but the new compound would provide a vanguard in the battle of wintry roads. It could also be a win for the environment, since the special salt is an alternative to sodium chloride, which is corrosive to cars and can harm plants and animals. You would see a lot more adopters of the electric car if no one ever had to pull over to charge one: Governments in the United Kingdom and South Korea are testing roads that have wireless charging pads buried in the roadbed; they supply a charge to a vehicle’s battery via wireless induction while it’s moving down the road. They work similarly to cellphones that charge by sitting atop an induction pad — except there’s no contact. The system would include a mechanism for detecting an approaching car in order to activate the charging. In South Korea, the system is being used on a 15-mile public bus route, where the people haulers never have to stop for juice. Audi’s Matrix LED lighting may be cleared for use in the U.S. It allows you to drive with high beams on all the time. A vehicle’s array of cameras identifies oncoming cars and pedestrians, then shuts off the “pixels” aimed directly their way so they don’t get blinded. Ultrathin OLED lighting allows entire exteriors of a car to be lit, for both safety and style. 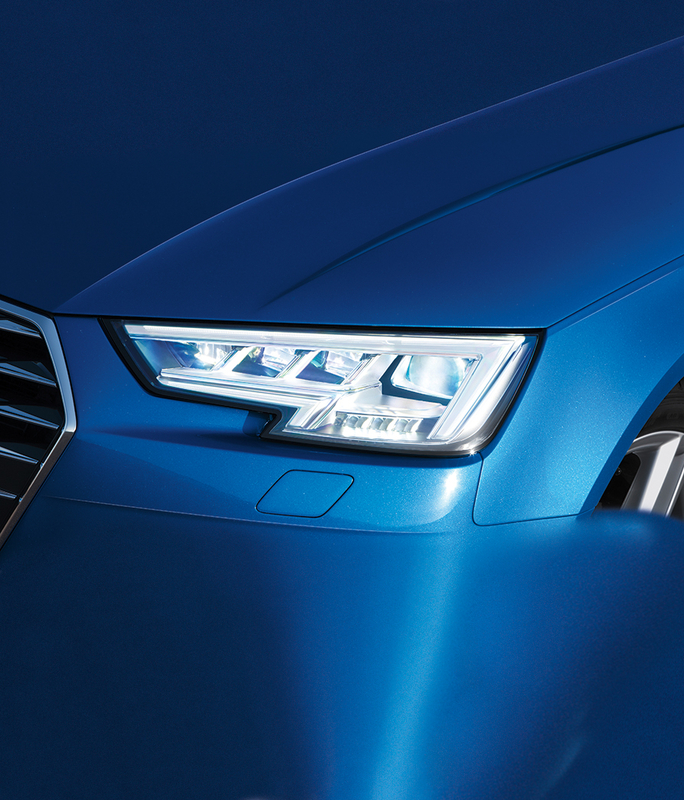 “Lighting will move from the front and rear of a car to all around it,” says Stephan Berlitz, Audi’s head of lighting development. Headlights will project animations in front of your car. “[These] ‘drones’ could point the way home or show you points of interest,” says Berlitz. What if you could see through your car? 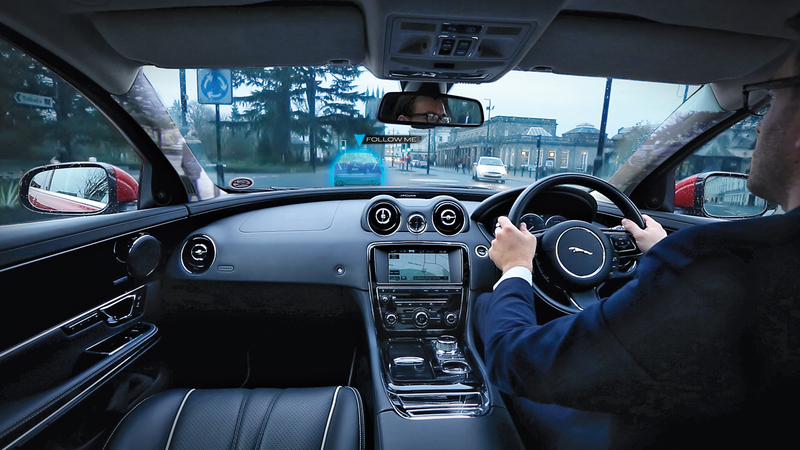 That’s the idea behind Jaguar–Land Rover’s virtual windshield concept, which kills blind spots by projecting live footage of objects you can’t see behind the pillars — such as a pedestrian — onto the inside of the vehicle itself, and continuing to highlight them across the windshield if they cross into your path. 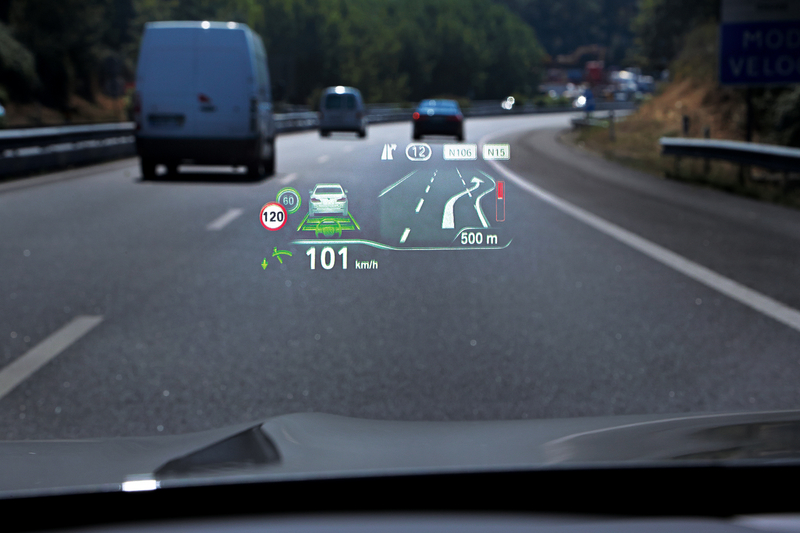 The virtual windshield concept also projects “ghost cars,” which could assist in navigation by leading you to the proper exit or turnoff, or help you find the fastest line around a racetrack. 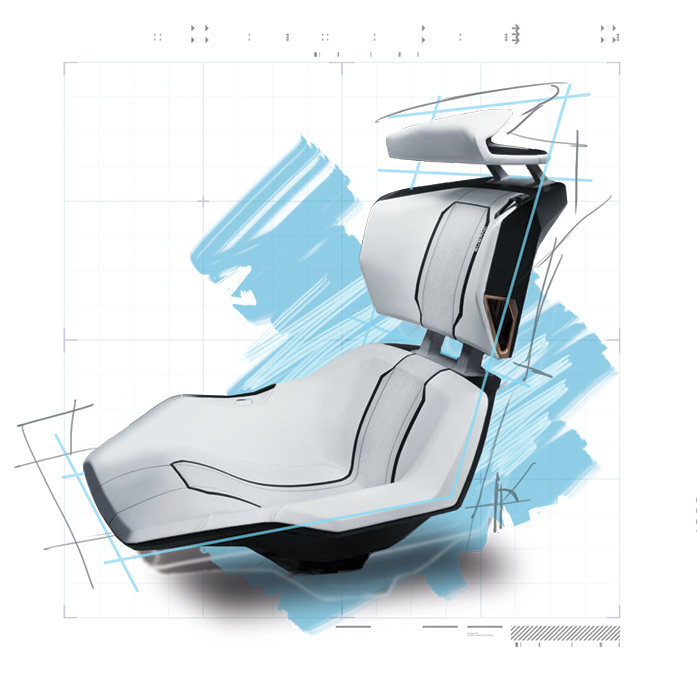 Though the ideas are still only concepts, they illustrate how heads-up displays will transform from simply replicating information from the instrument panel to enhancing your vision. Tesla recently added a “Summon” feature to its Model S’s and X’s retinue of tricks, allowing drivers to step out as the car self-parks via smartphone. 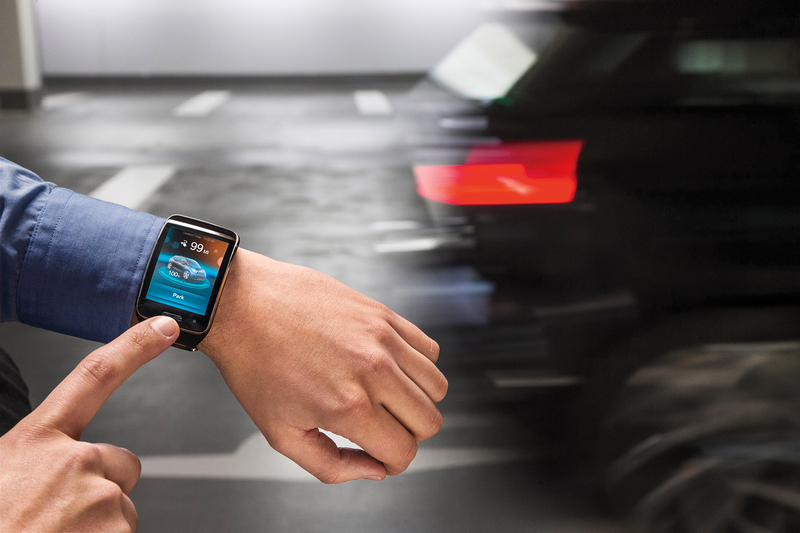 (BMW has a similar concept that uses a smartwatch.) Since a person doesn’t have to open a door to get out, the vehicles can squeeze into smaller garage spots than were previously possible. It’s a huge step toward the day when our cars serve as robot valets, dropping us off, then shuffling away to park in a garage out of sight. While autonomous driving gets the buzz, some experts say that autonomous parking garages may come years earlier. “Since you’re dealing with low speeds and garages that would be closed off to foot traffic, liability issues can be resolved in a much more straightforward way,” says Aaron Steinfeld, an associate research professor at Carnegie Mellon’s Robotics Institute. Steinfeld helped develop a self-parking system in 2010, and he says autonomous parking will change urban planning. “In time you will see less square footage dedicated to parking and more space for pickups and drop-offs,” he says.